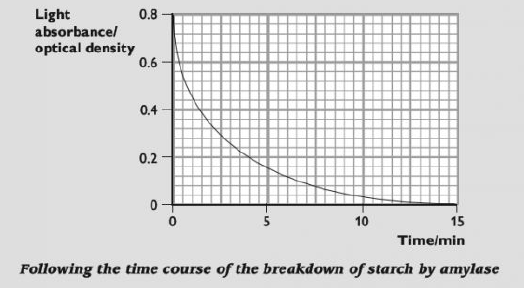 Measurement of the rate of formation of the product or the rate of disappearance of the substrate. Mash up some biological material like potato tuber or celery stalks, mix them with water and filter the mixture to obtain a solution containing catalases. Add the mixture to H2O2 (hydrogen peroxide) in a test tube. Use small tubes --> not too much gas in the tube above the liquid. 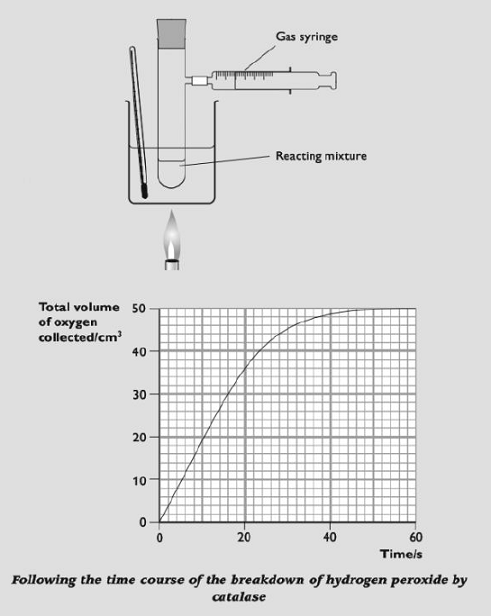 Collect the gas in a gas syringe and recording the volume every minute until the reaction stops. Note - You can replace the gas syringe by an inverted measuring cylinder over water. Add amylase solution to starch suspension in a test-tube. Take samples of the reacting mixture at regular time intervals, and test for the presence of starch using iodine in KI solution. When starch is present, iodine is dark blue. If the blue colour lightens, starch is breaking down. 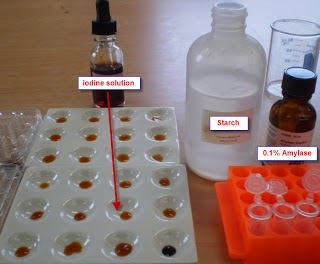 When there is no starch, the iodine solution will remain orange-brown. To obtain quantitative results, use a colorimeter. Put some of the iodine solution into one of the colorimeter tubes, place it in the colorimeter and adjust the dial to give a reading of 0. This is your standard, with no starch. Every minute, take a sample of the liquid from the starch-amylase mixture and add it to a clean colorimeter tube containing iodine solution. Mix thoroughly, then measure the light absorbance. The darker the blue-black colour, the greater the absorbance, and the greater the concentration of starch.